UPDATED: Wed., May 2, 2018, 5:06 p.m.
DENVER – The Dallas Stars reached into the collegiate ranks to find their new head coach. It’s a strategy that’s certainly working out well in Philadelphia. 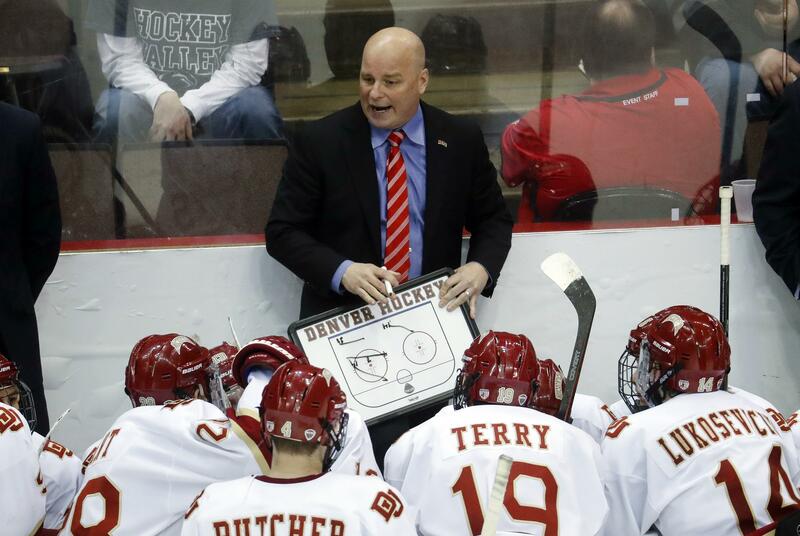 The Stars will hire the University of Denver’s Jim Montgomery as their next coach, a person with knowledge of the situation told The Associated Press on Wednesday. Montgomery takes over for Ken Hitchcock, who retired last month and will become a consultant for the Stars. The person spoke on condition of anonymity because the hiring had not been announced. Montgomery becomes the second college-to-NHL hire in the past three years, following the Flyers’ Dave Hakstol in 2015. Hakstol was considered one of the premier college coaches at North Dakota before making the switch. The Flyers have gone to the playoffs in two of the three seasons Hakstol has been in charge. Dallas is banking on a similar showing under the 48-year-old Montgomery, who spent five seasons in charge of the Pioneers and led them to a national title in 2016-17. He finished 125-57-26 at a university well known for its hockey and lacrosse programs. Montgomery inherits a Dallas squad led by Jamie Benn and Tyler Seguin. The Stars are coming off a season in which they missed the playoffs for the eighth time in 10 seasons. Hitchcock returned for just a season before hanging it up. He’s the only coach to lead the team to a Stanley Cup title. Before his arrival in Denver, Montgomery spent three seasons as the head coach/general manager of the United States Hockey League’s Dubuque Fighting Saints. He also served as an assistant coach at RPI from 2006-10. He started his coaching career as a volunteer coach at Notre Dame in ‘05-06. As a player, Montgomery led Maine to a national title in 1993 before embarking on a 12-year pro career that included stops in an assortment of leagues, including parts of six seasons in the NHL. He finished his career by playing one game for the Stars during the `02-03 season. Published: May 2, 2018, 3:35 p.m. Updated: May 2, 2018, 5:06 p.m.